The purpose of the investor pitch presentation is to get the investor interested in learning more. For all the time spent on developing and fine tuning your investor pitch, the last thing you want is to lose an investor’s interest because of a preventable mistake. 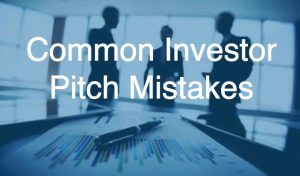 Here are the most common investor pitch mistakes and what to do instead. An investor will want to learn more about your company if they are inspired by your mission, not because they understand every detail of your company. Too often being thorough in the investor presentation is mistaken for answering all possible questions. If the investor is inspired by your company, they will take the time to ask the questions after the presentation. If you include too much detail upfront, you run the risk of diluting the core focus of your pitch and causing the investor to lose interest. Did you know that the average investor pitch deck is nearly 30 slides long, but the average investor only pays attention for 10-15 slides? Many entrepreneurs view their investors and consumers differently from one another. But are they so different? Both consumers and investors put money into your company because they believe in the value your company creates. Psychologists discovered long ago that consumer actions are driven by emotion, and justified by logic. It goes to argue that if you want an investor to capitalize your company, you need emotional buy-in. Only then can you help them justify the investment logically. Most people would agree with this argument. So why do entrepreneurs pitch the logical argument of investing in their company before getting emotional buy-in? The entrepreneurial journey makes it easy to fall into this trap. Entrepreneurs found companies around an idea that supports their core beliefs. This core belief is the emotional buy in that the entrepreneur needs to commit and succeed in creating their company. Once the entrepreneur emotionally buys in, their mind shifts to the logical side of the venture development. Is this feasible? How do we make this happen? What do we do next? An entrepreneur ready to pitch investors has normally found awesome answers to these questions (and these aren’t easy questions to answer! ), and is rightfully excited to talk about these answers. So they go into the investor meeting and talk about how they logically developed a solution to a problem. The problem is… the investor does not have the emotional engagement to the company that the entrepreneur developed while forming the idea of the company. Without this commitment, an investor can agree with every logical argument, but not get out their checkbook to invest. In other words, the investor will not write a check if they understand HOW your company got to where it is, but they will write a check if they understand WHY your company got to where it is. Start your pitch with the problem and why you want to fix it, not the solution. Emotional engagement to the problem you are trying to solve is often the best emotional buy in you can have. Talk about financials and projections of the company at the end of the presentation. Capital return alone will not drive investment. In keeping with the entrepreneurial logical and process mindset, many people have the tendency to pitch the features of their product or service. But features speak to logic, and benefits speak to emotion. Talk in terms of the value your customer perceives, not the features that create that value. Would you rather buy a bed, or a good nights sleep? Would you rather have 1 GB of extra memory on your phone, or have 1,000 songs in your pocket? It is better to do one thing very well than do many things trying to solve too many problems. Peter Thiel, cofounder of Paypal and Palantir, believes a company should start when they have a technology, product, or service that is 10 times better than their closest competitor. Proving that you’ll be big by listing all the problems your company can solve is not a good approach and a major red flag to investors. You will come across as unfocused and undisciplined. Even if your company is a home run, the investor will not have confidence that you’re the one to bring it to market. Once you have established that you have a product that is 10 times better than your competition, Peter Thiel goes on to argue that you have to start with a small market. Companies that you see as monopolies today, all started small and strategically sprinted into target markets one at a time. Facebook started with Harvard students. Paypal started with eBay power-sellers. Amazon started as an online bookstore. Showing traction is one of the most important parts of every pitch to investors. If you don’t have traction, it is significantly harder for the investor to justify investment in your company. Not to mention, organic feedback will drastically improve your product or service. Remember, if the investor invests in your company, you become teammates. Proven market traction will help them persuade co-investors to join the offering. Every company has competition. Whether it is direct or indirect competition, you need to equip yourself to prevail. Not addressing your company’s competition can signal a lack of understanding of the competitive landscape. Or worse, if you truly have no competition, that might be a sign your company has no viable market. Stay agile. Competition can innovate too. Just because they are not competitive with your company today, does not mean they will not provide 10 times value over your product or service in the future. Every investor has different parameters that determine a good investment from a bad one. There is not a one size fits all approach for pitching an investor. To get emotional buy in from the investor, you need to understand the environment that you will be pitching your company in. Be able to adapt in the meeting. Your research will not uncover everything you need to know. Trust your instincts and be yourself. Too often entrepreneurs get wrapped up in discussing their company, that they forget the most simple part. You are pitching investors for one specific reason – your company needs capital. Don’t forget to ask for it! Outline the use of proceeds. If you do not know how you will allocate it, you are not ready to ask for investment. Would you give your money to someone who was not sure how they are going to use it? A complete course on the Funding Pitch in one article. Well done! Having hosted a ton of these both in person and virtually for companies these tips are pretty spot on.